Over the years, word processors have taken on board aspects of desktop publishing software, and in doing so have become over-complex and bloated. To that end, many Mac users fire up TextEdit when all they want to do is write. Bean attempts to offer something of a halfway house — the speed of TextEdit, but with some advanced features that Apple's own editor lacks. 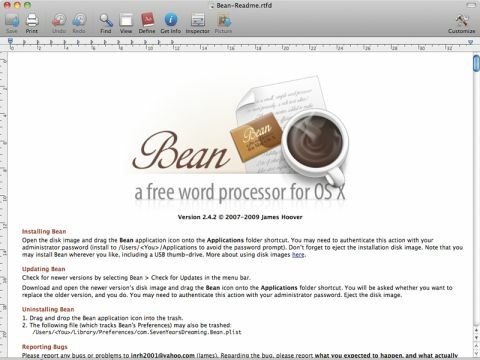 In use, Bean comes across like an unreleased TextEdit Pro. It lacks a few TextEdit features (autocomplete in Snow Leopard being the sole major omission we noticed), but adds live word count, basic templating, date-stamped backups, and an enhanced Find panel. Writing is also sped up in various ways: keyboard shortcuts provide access to a huge range of actions; selections can be made by font style, family, size or colour; and there's even a handy Complete Word option, for when you're struggling with how to spell tricky words. We were also impressed by Bean's interface: the main window's toolbar and icons are great, and Preferences enable important things to be configured to suit. Obviously, there are restrictions with an app such as Bean. Although it reads and writes to various formats, including DOC and DOCX, compatibility is limited — images, tables and formatting will be stripped from DOCX, for example, leaving just text. However, for writing quick notes, Bean is a must-have download for anyone who wishes TextEdit offered a little bit more.